Bali Souvenior Shop Beach Walk is located at Pantai Kuta street. You can will wind from the sea during shopping in the mall. There are many kinds of butique, surf shop, moreover lage cinema with VIP seats. Also, you can enjoy various foods in restaurants. At evening, it wiil be nice when you look beautiful sunset from 2 or 3 floor of the building. It was the first time in years I went to Bali, the roads have completely changed, I was surprised when I went to Kuta. There are a lot of new buildings built, the tour got more fun. It was the first time for me to go to Beach Walk. 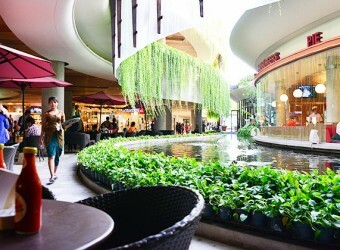 This open air has also cinema and has a lot of shops inside. I had a fun shopping here, and it was easy to find place for eating.